End of June and we had an absolutely stunning day at Wytham. Mike and Zack from Skycap came up with their DJI Inspire and filmed the standing oak for the BBC documentary; we got some lovely footage around the tree which we'll see in the finished piece. Then we flew up from the site where Olli and Teemu from the Finnish Geospatial Institute (FGI) of the Finnish National Land Survey (NLS) have been based the last few days with their very impressive custom-built hexacopter. They have a multispectral imaging camera, with a gimballed cosine head downwelling irradiance sensor (for those who want to know!) 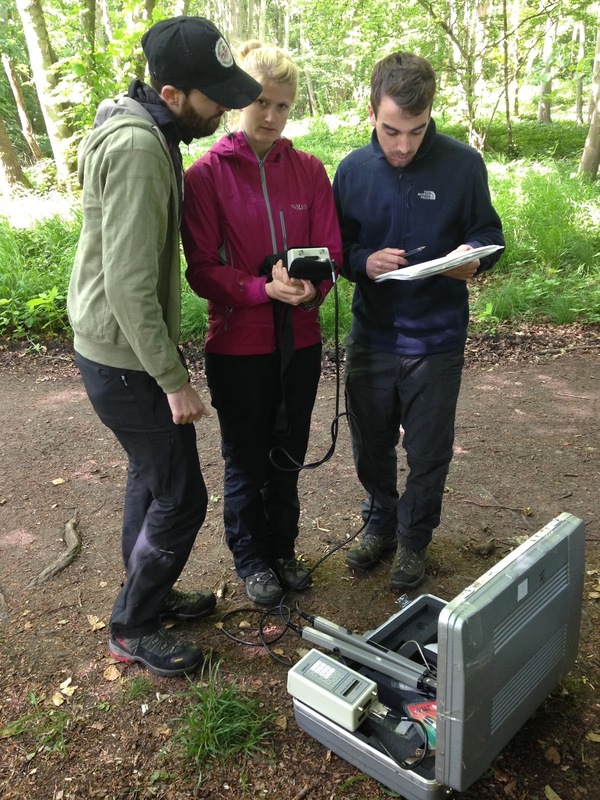 which allows them to capture quantitative measurements of reflectance, not just pretty pictures. The first look at the Skycap footage is pretty stunning. 30 C and blue as the sea - the sky is always like this in the English summer - in my mind at least. I was very impressed with how steady the camera gimball kept the view regardless of the drone attitude. You can see the flux tower from around 0:20 s in, towards the top centre of the wood. The aim is to try out height model software, compare with the NLS data, and the Riegl canopy height model data. 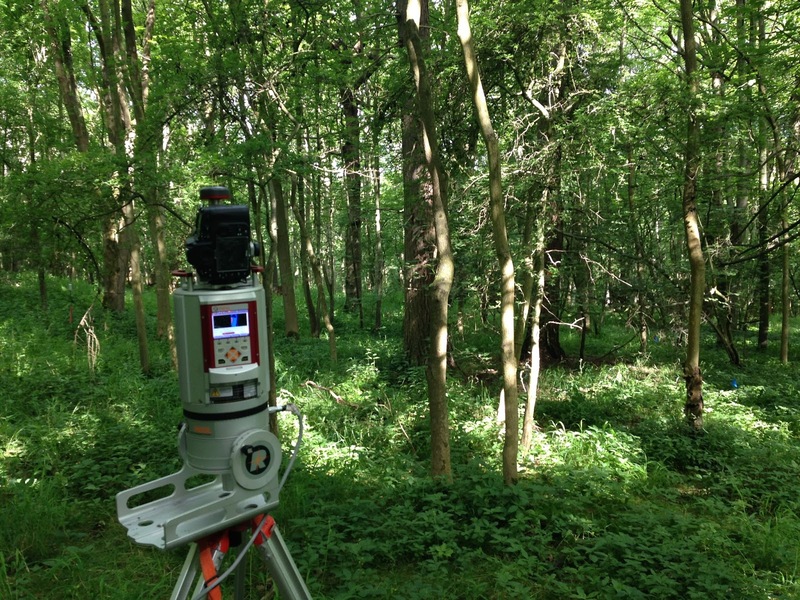 We've been working in Wytham Woods, just outside Oxford, over the past few weeks, scanning and characterising the forest structure in a 6 ha (300 m x 200 m) area. This is the the largest single area we've scanned so far - quite an ambitious task, and is part of our work on the EU-funded METEOC-II project. Although the forest is not as dense or tall as the tropical forests we've encountered in Gabon, Brazil and elsewhere, it's still a challenge. Kim has been leading the team (Niall, Ally et al. from NPL, along with Toby and others from Yadvinder's group at Oxford) in setting up the plot, marking out the 176 (!) separate 20 x 20 m grid points, laying out targets and then doing the 352 resulting scans. 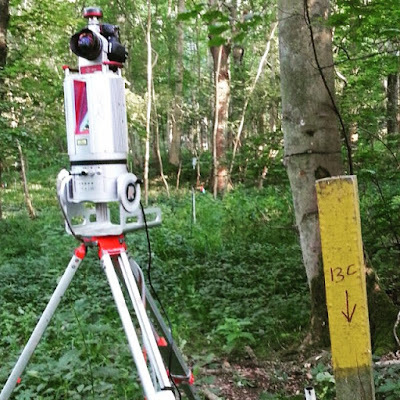 Following the lidar scanning, we're collecting LAI and hemiphoto measurements at all the grid points in the plot. The aim is then to be able to use the lidar data to generate a detailed 3D model of the whole site - something that's never been done before on this sort of scale - both leaf on, and leaf off. We'll then be using the model to simulate satellite observations, as well as ground-based observations (hemiphotos, LAI, fAPAR etc) with the aim of being able to provide traceable uncertainty from ground mesrements through to satellite observations. This is essentially impossible to do in 'real life' because you never know what the real LAI or fAPAR of a site like this is. So we're using the 3D model to simulate this process. A rather lovely view from under the canopy in Wytham, showing the rather beautiful sun-dappled understory. The woods at Wytham really are a lovely place to work, and very convenient. We're able to visit quickly, and there's a lot of other work going on with various groups, meaning there's good infrastructure. And good pubs and coffee within a 10 minute drive - essential, particularly if you're working there for several weeks at a time. 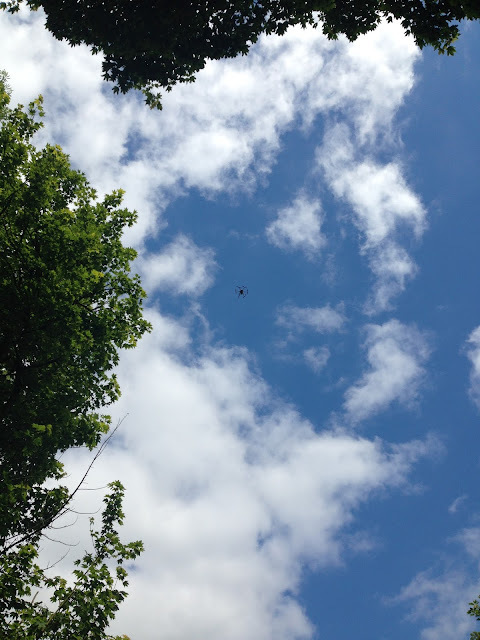 The Finnish Geodetic Institute UAV coming in to land. 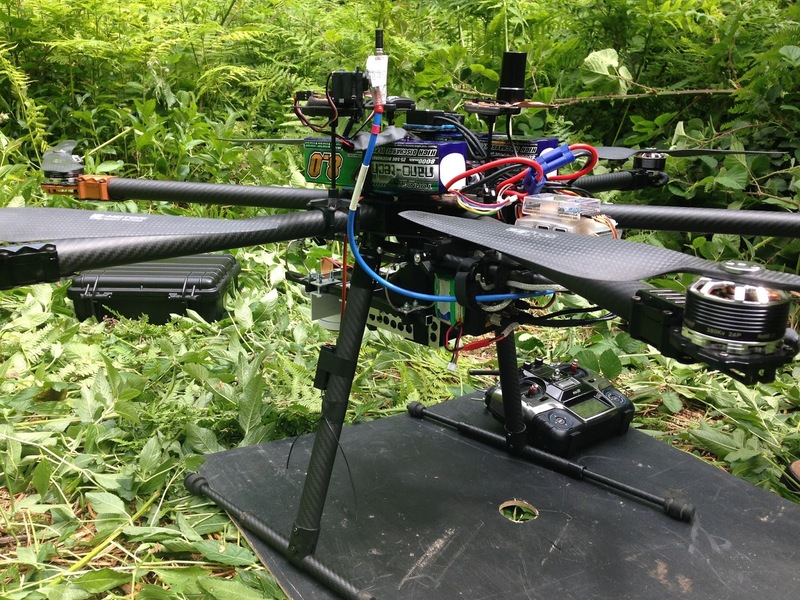 Meanwhile, our colleagues from Finland have been deploying their UAV, with a gimbal-mounted hyperspectral camera on board, to collect spectral data from above the 6 ha site. This will tell us about what's going on in the upper part of the canopy. They have a very nice set-up on the UAV, with a cosine-weighted irradiance sensor (also gimbal-mounted) and some portable calibration targets on the ground. An impressive bit of kit. The video shows it coming in to land. The FGI UAV. Note the irradiance sensor on the very top with the white housing. The last of the 352 scans. Kim is happy. Kim, Ally and Niall (L to R) try and get to grips with the rather primitive menu on the LAI2000. It's not iOS, for sure.